I just wanted to give you a sneak peak at a few of the new pieces that I will be adding to my Etsy shop later this week. There's definitely a vintage button theme going on! 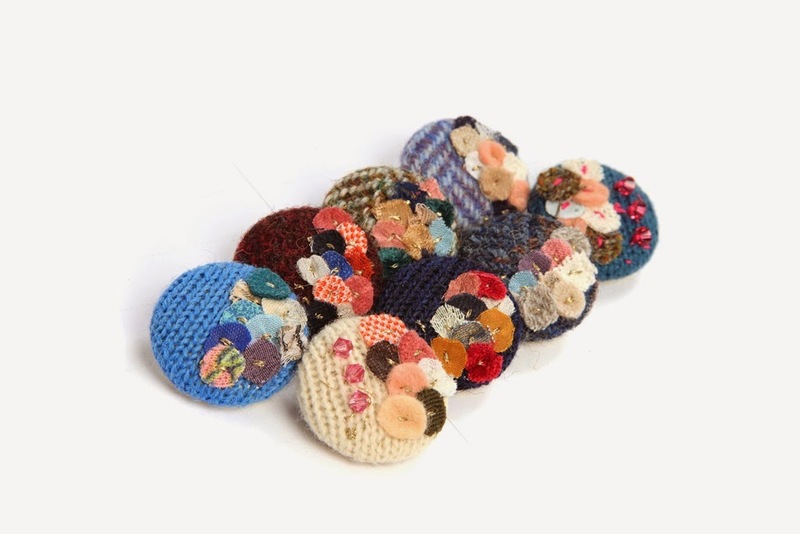 There are new colours in my handmade knitted brooches, new hair slides and rings. Check out my over sized flower ring embellished with a vintage button- very summery! I'll let you know when I add them to the shop. Look out for new stockist news later in the week too! Following on from my first embroidery class post, today I wanted to update on how the embroidery is coming along! We have finished our first piece, a small flower sprig that allowed us to practice french knots, stem stitch and satin stitch. I'd like to immortalise the finished piece as a card or a notebook cover. Perhaps as an embroidery class notebook cover, decorative and useful! I'm finding the classes so therapeutic that at the moment I just want to embroider everything, so I can feel lots of notebook covers and cards coming on! Then we had great fun colouring the drawing with acrylics! Once dry, we began embroidering the outline of the mushroom in stem stitch. Our homework is to continue adding the embroidery and I'm so looking forward to carrying on with it tomorrow! At the start of the new year I decided that I wanted this to be a big year for learning so I'm really enjoying having a dedicated time devoted to learning these new skills and I'm looking forward to reflecting what I've learnt in my work. On Sunday my Mum and I took the train to London to visit York Hall in Bethnal Green, which was playing host to the London Vintage Wedding Fayre for the day. I had been really looking forward to Sunday to get inspired with wedding ideas and I wasn't disappointed! These handmade, vintage inspired dresses by Ears and Whiskers were absolutely beautiful and are custom made to fit each bride. Completely in love with the dress in the foreground! Another dress I fell in love with! This vintage wedding dress from Story of My Dress really tempted me and the ladies were so friendly and helpful, I'll definitely be keeping them in mind. They are opening a bridal boutique in Kent in September so I'll definitely be going along! 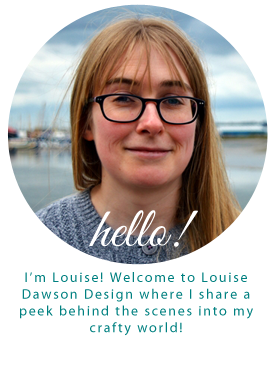 Rosie creates her unique pieces using vintage beads, brooches and trinkets, meaning no two are the same. I left the fayre feeling really inspired with wedding ideas, and my Mum and I were both very impressed with the event. So, a vintage themed wedding it is then! An update on how the new project is coming along- it's getting colourful! I'm using scraps of Liberty fabrics, embroidered tray cloths and oddments of lace, machine stitched together. I've over-dyed some of the pieces using Permaset eco friendly screen printing inks in Rose and Glow Yellow, which I love! I've also made some printing stamps using odd blocks of wood and fun foam and I'm starting to experiment with over printing the stitched pieces using the Permaset inks. I'll keep you updated as I continue with these experiments- I'm hoping that I can develop these ideas into a summery jewellery collection. Watch this space! This Sunday afternoon just gone, Mr Writer, my lovely In laws to be and myself visited the beautiful Ulting Wick Garden near Hatfield Peveral, Essex. The garden is open for charity several times throughout the year and the 11 acres of garden surround a 17th century farmhouse and 3 listed black Essex barns. It was a lovely sunny Sunday afternoon and thousands of Tulips were in full bloom in the main heart of the garden, which was once a working farmyard. I ever knew tulips came in so many colours! I'd be interested to visit throughout the year to see how the gardens develop, but Ulting Wick will next be open on Friday 9th May from 2pm-5pm and I'd definitely recommend a visit to catch the Tulips in bloom! This character was hiding among the branches! It was a floral themed day so I wore my floral Joules pumps, which I love! Hope you're all enjoying the spring flowers local to you too!